About a year ago Newcastle was granted £5.6m from DfT to make the city fit for cycling, or at least make a good start towards it. The City Cycling Ambition Fund (CCAF) was awarded to cities which demonstrated the ambition to build quality cycle infrastructure and re-allocate road space for bikes to enable new people to cycle and a positive modal shift away from the car. The funding has to be spent by March 2015 and four SCRs, at least in part, were to be built. Scott, and sometimes Kat, have attended the fortnightly Technical Advisory Group (TAG) meetings since last summer which look at plans and discuss design solutions. While Claire is involved in the Stakeholders group which is held every two months, a group where proposed plans are shared with the wider community. So a year later, what progress has been made? It is fairly clear that the overall programme is in the red, with most schemes lagging behind and time pressing on. Nothing to date has been built with CCAF resources. Not even a scheme under construction in sight. We keep hearing “there’s not much time” and “decisions have to be taken very quickly”. It sounds a bit like a panic has broken out. And not in a good way. The city centre improvements – with a significant amount of resources on hold due to the wider city centre plans being developed. To date, we haven’t seen any concept drawings and to go through the entire process from preliminary design to construction including the mandatory consultation phase in 9 months is somehow presumptious. And the question is where will the money be spent instead? The Walker SCR7 beyond Shields Road has been dropped – again a significant amount of resources had been earmarked for it. The Welbeck Road debacle seems to be unable to resolve so no CCAF monies will be spent in Walker. But again it raises the question of how the money will be re-allocated. 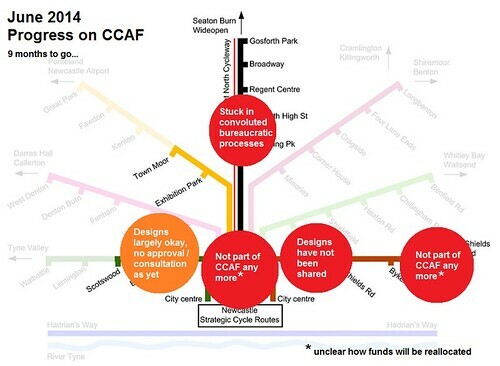 Plans for the route improvement on the Byker section are significantly behind and completion now falls outside the CCAF timescale. The Gosforth SCR4 (High Street improvements were kept separate from the CCAF programme) is significantly behind – and we are not entirely sure how the plans discussed through the different groups are going to be taken forward. Detailed designed and the final consultation for Brandling Park (a route of interest for Jesmond too) and the hybrid lanes North of Broadway have yet to be released and be initiated. It hasn’t been easy to reconcile schemes and figures – schemes have been amended, brought forward and/or added as part of the development of a wider programme of works without further discussion or input. The forum has not been kept informed of these changes. We are left wondering how the full CCAF grant will be spent. And most importantly, from a campaign’s point of view, whether we will have quality cycleways built by proper road space re-allocation. Yes, Newcastle badly needs good news, a flagship cycleway which we can all be proud of, rather than spot improvements and monies spent on signage or feasibility studies which won’t get new people cycling. Three SCRs will be of crucial importance over the next 6 months: the Elswick SCR which has been designed and council has started to talk to communities, Gosforth SCR sections North and South of the High Street, and the first couple of miles of the Walker SCR, for which design and plans haven’t even been shared yet for comment. So yes, we are very worried. We are asking the CCAF Board and the decision-makers involved to keep the focus on what the funding was originally intended for and keep the engaged interested parties better and more adequately informed.